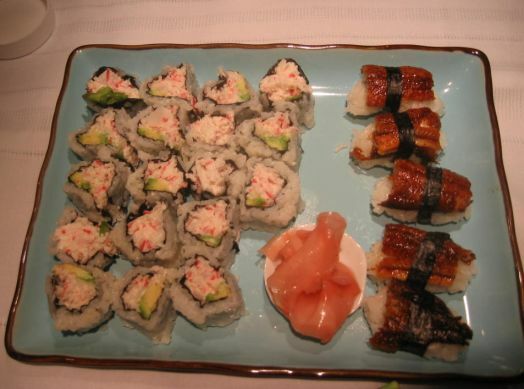 I finally gave in to Kevin's request for a sushi dinner!. 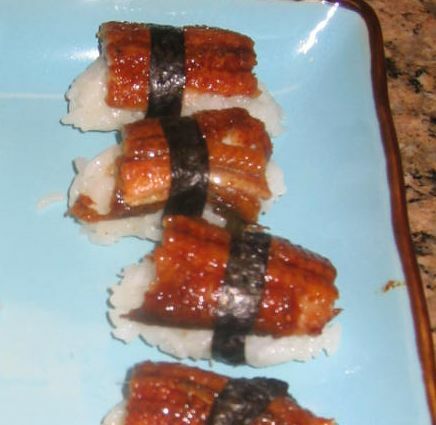 I was going to make a few California rolls for dinner but Kevin said: "Mom, beside the California rolls, can you also make a few Unagi Nigiris and some soft shell crab rolls?". "What!" I replied, "that is a lot of work!... 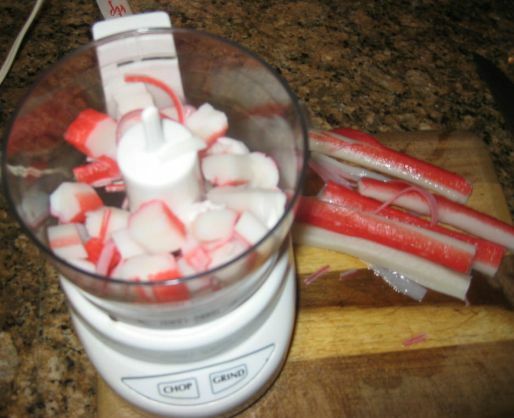 but okay since I am going to make sushi, I might as well make a few different kind of sushi" . 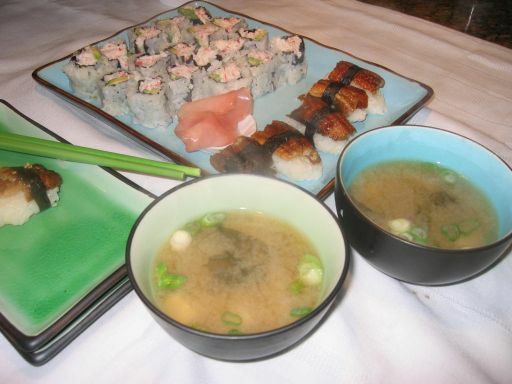 California rolls and Unagi Nigiris. 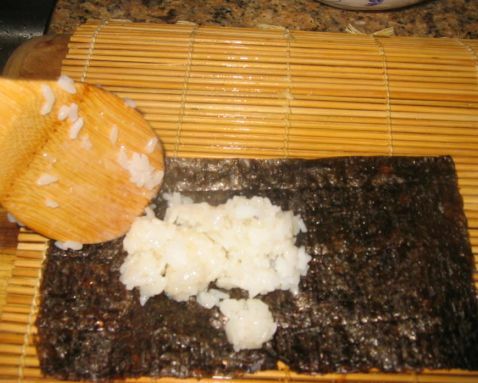 Nigiri is an oblong mound of sushi rice that is pressed between the palm of your hand, sometimes with a speck of wasabi, and a slice of fish draped over it, bound to the rice with a thin strip of Nori, most commonly Tako (octopus), Unagi (freshwater eel), Anago (sea eel), Ika (squid), and Tamago (sweet egg). 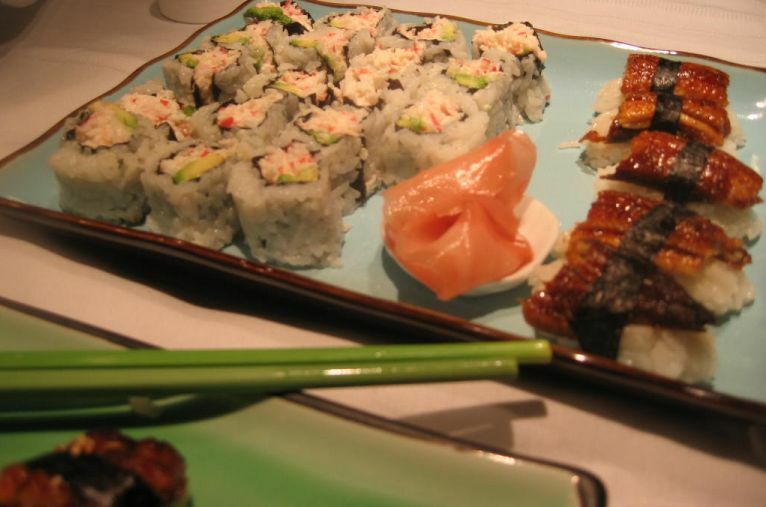 Nigiri is generally served in pairs. 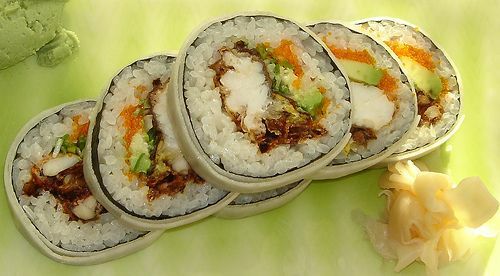 During the 1970s, an unknown California chef, realizing that many Americans did not like the though of eating raw fish, created the now famous California Roll, made with crab, avocado, and cucumbers. 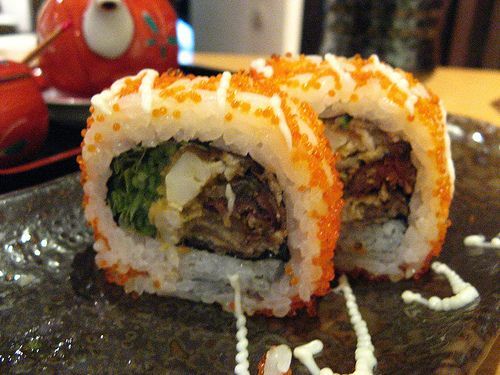 Most people in Japan have never heard of the California Roll, it is an American interpretation of sushi. 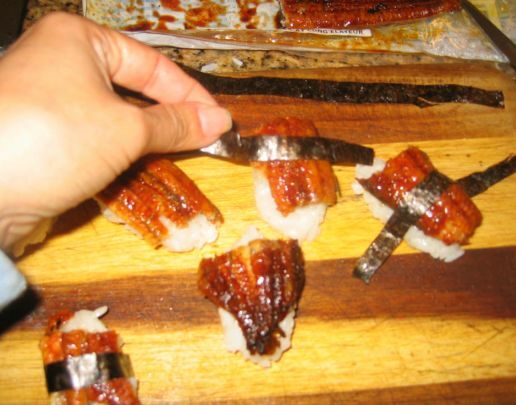 Grilled Unagi is a delicacy in Japan! 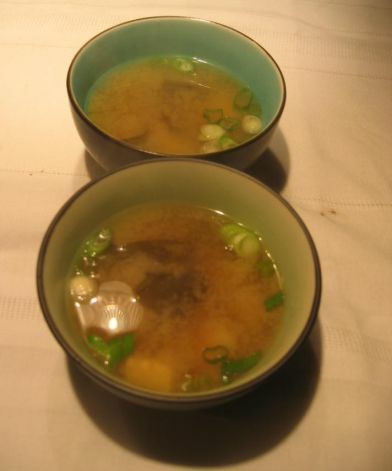 A sushi meal is not complete with some home made Miso soup! Setting up the table so we can eat our meal. 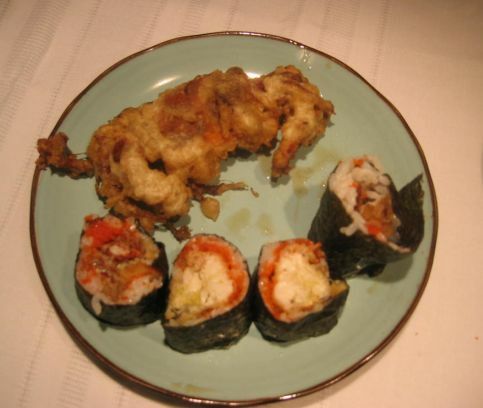 And finally one my favorite sushi is the Soft shell crab roll. 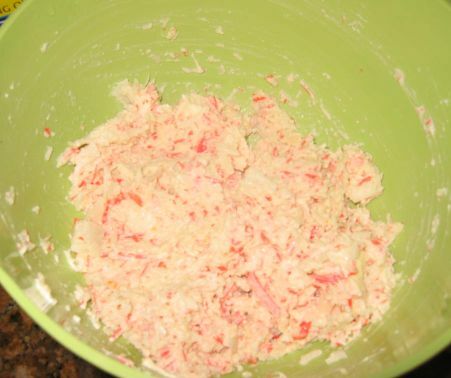 So it took me about an hour to prepare this meal and I think we gulped the whole thing down in less than 15 minutes! 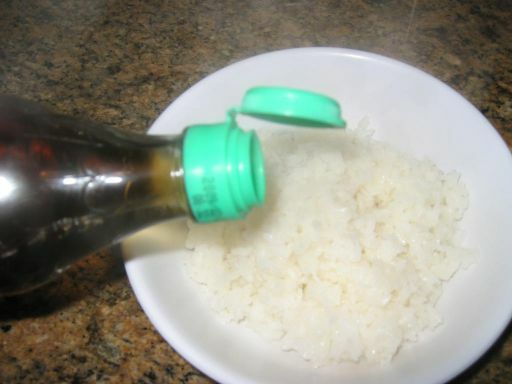 Talking about being hungry tonight! 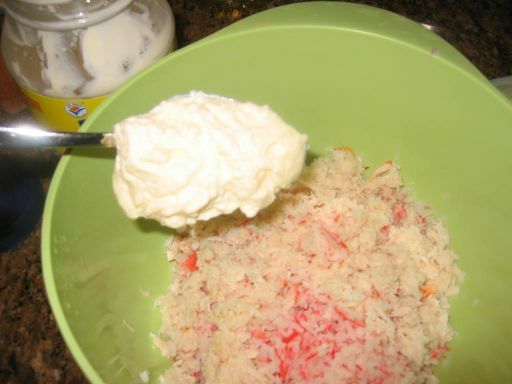 Real crab meat is added into the imitation crab. 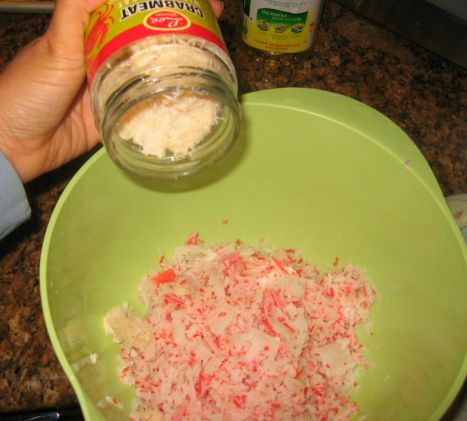 The crab meat mixture is then put aside while I am preparing the sushi rice. 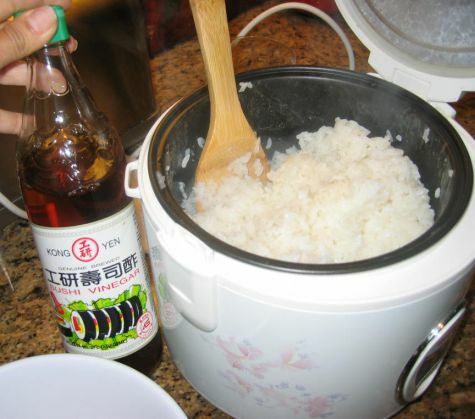 I am seasoning the rice with sweet vinegar to become sushi rice. 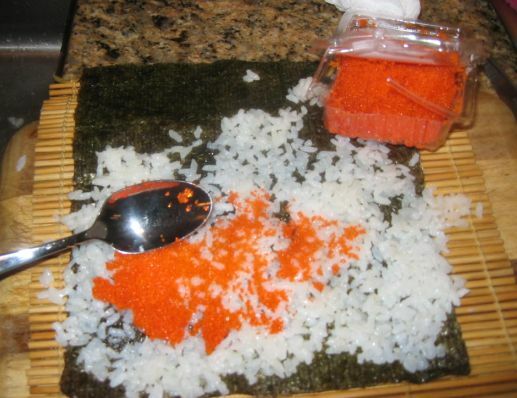 Here I am spreading the sushi rice on top of the Nori sheet. 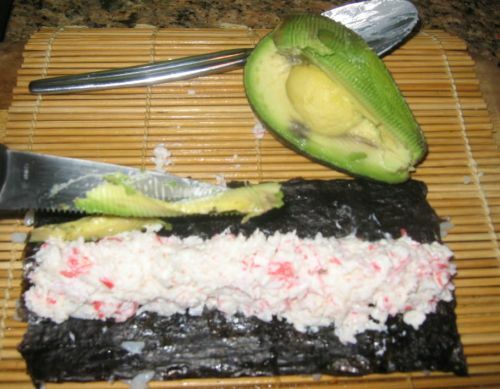 The nori sheet is then turned over and I am spooning some crab meat mixture and avocado. 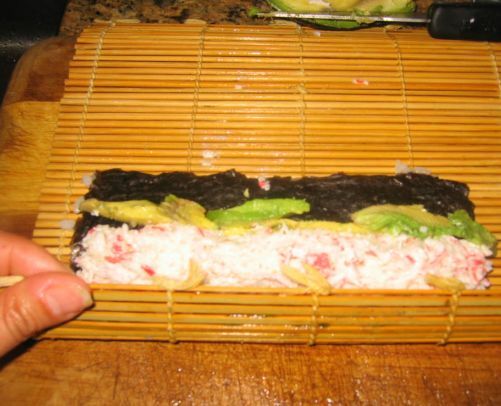 Close up of how to roll a sushi. 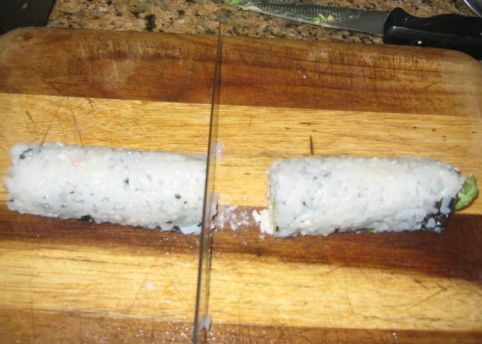 The sushi is then cut into 6 portions. 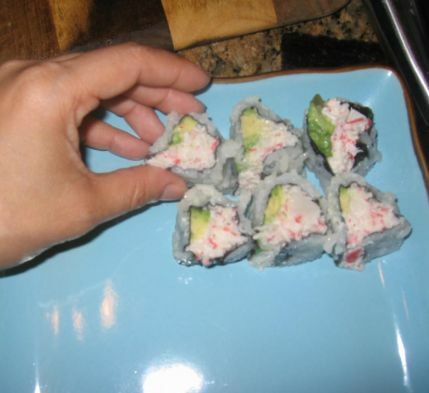 I am plating the California rolls. 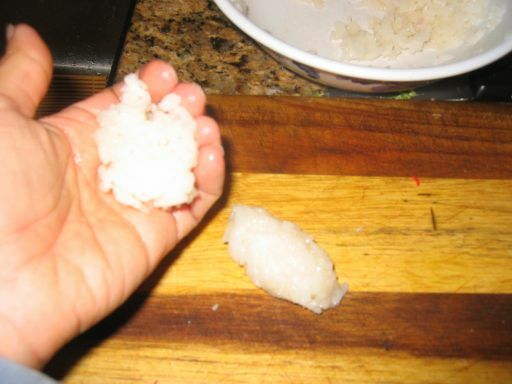 The sushi rice is hand formed into a small clump. 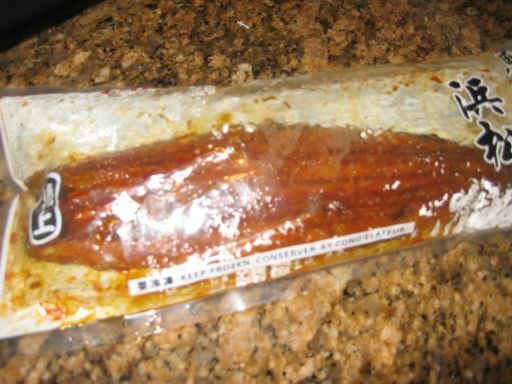 The Unagi are store bought and then put in the microwave for a few minutes to heat it up. 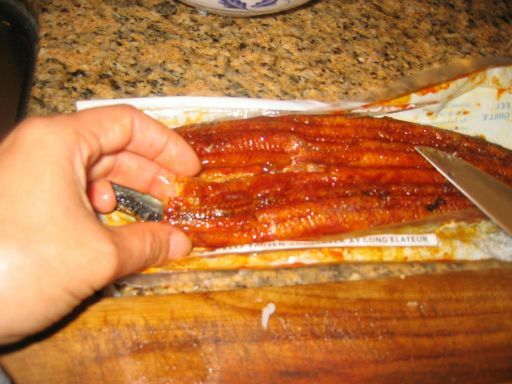 cutting the Unagi into small piece. 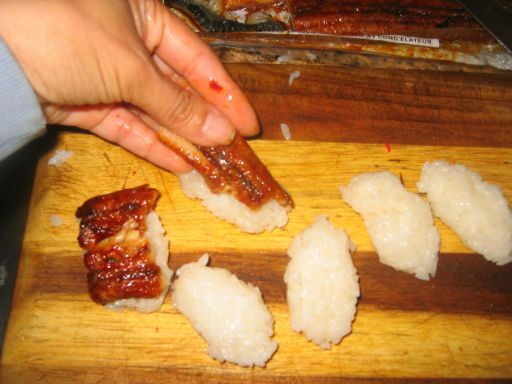 Putting the Unagi pieces on the sushi rice. 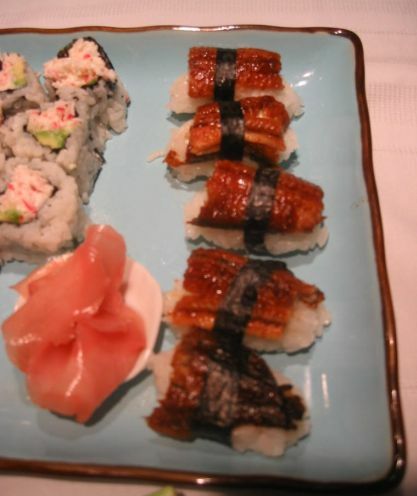 Securing the Unagi with a strip on Nori. 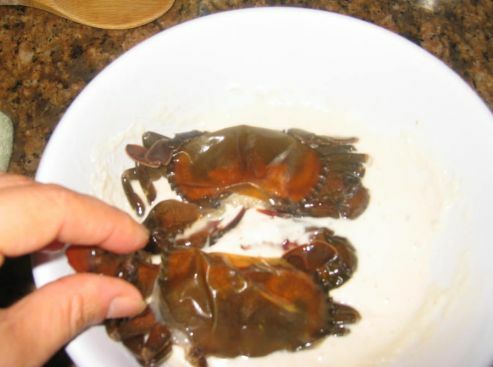 Dipping the soft shell crabs into a tempura batter. 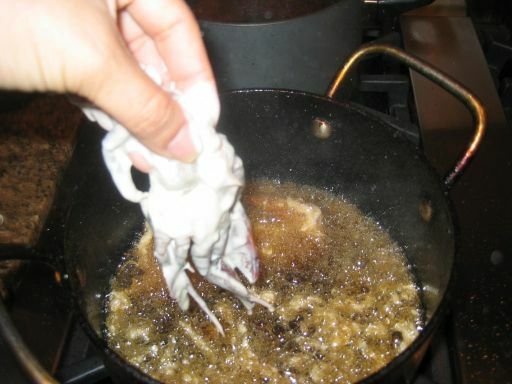 Deep frying the soft shell crab. 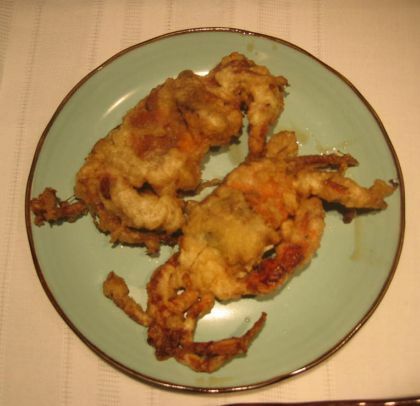 The soft shell crabs out of the fryer. 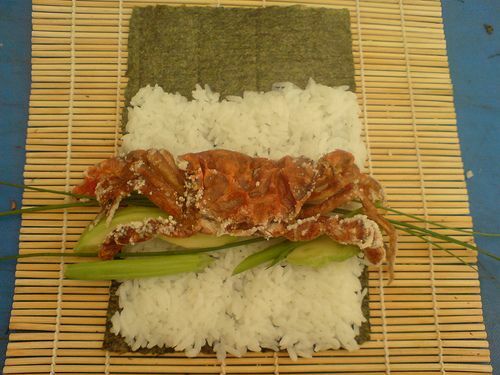 Preparing to roll... Nori sheet filled with sushi rice and fish egg roe. 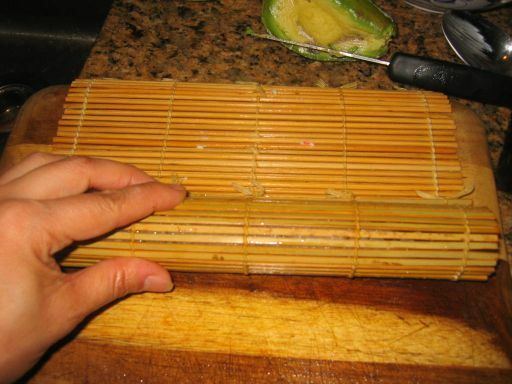 The roll is then cut into small pieces.